The recent release of Deadpool may have proven that an R-rated comic book movie could turn a profit, but the adventure of Wade Wilson is not the only faithful R-rated comic book movie to hit theaters in recent years. Dredd achieved cult status in 2012, and die-hard fans have clamored for a follow-up film ever since. It turns out that Dredd star Karl Urban also adores the original Dredd, and he recently implored streaming services Amazon Prime and Netflix to consider producing a sequel in the near future. Check out his tweet below. Karl Urban recently released the above tweet as a plea to potentially get Dredd 2 off the ground. The original film wasn’t exactly a box office smash, but it has gone on to achieve a cult following due to its incredibly respectful depiction of the titular character, and its willingness to portray unflinching levels of violence on screen. Rumors have swirled about a potential sequel for years, but nothing has ever really come of them. With this new tweet, the actor seems to have once again affirmed his commitment to the potential project by citing services such as Netflix and Amazon as perfect platforms for the adaptation. 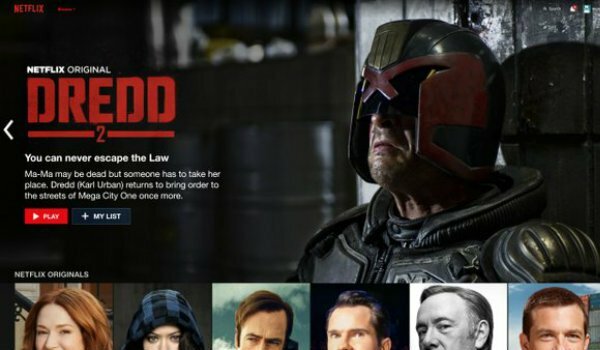 Accompanying the tweet is a mockup for what the Dredd sequel could look like on the Netflix main menu. The fake film even includes an awesome synopsis highlighting how the sequel could potentially involve Judge Dredd handling the power vacuum left by Lena Heady’s Mama following her swift (and brutal) execution at the end of the original film. Dredd hinted at a dark, painful history for the terse, perpetually masked hero, so Karl Urban isn’t wrong when he claims that there’s a "goldmine" of potential story to tell for this particular character. If there’s one thing we have learned over the last couple of years, it’s that a streaming service like Netflix could make an absolutely perfect home for a badass, visceral character like Dredd. Considering the phenomenal work they did with characters like Daredevil, Jessica Jones, and – perhaps most importantly – The Punisher, it wouldn’t be a huge stretch of the imagination to see them absolutely killing a future Dredd sequel. The overall response to Karl Urban’s tweet has been nothing if not positive. We live in an age where fans get what they want if they make their collective voices heard, so Dredd 2 might not be dead yet. We will keep you up to date with any and all information related to the potential project as it becomes available to us.